Japanese beauty brand Shiseido has enlisted pop star Lady Gaga as the model – and photographer — of its New Year ad campaign. For the campaign which will run only in Japan, the singer took 50 selfies, 46 of which were featured on national and regional newspapers on January 1, and the remaining four unveiled on January 5. 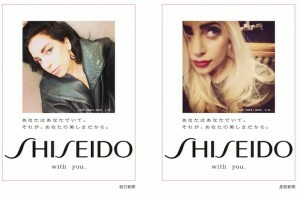 The emphasis is on “Shiseido with you”, the makeup brand supporting women who want to create their own style. Shiseido has also created a new “Vision 2020″ strategy looking ahead to the Tokyo Olympics, which will see the brand diversify and personalize. While the selfies are displayed on her Instagram (not mentioning it was for a marketing campaign), the images will also be available online by January 13 on Shiseido’s marketing website. A fansite has also uploaded compiled photos of the newspaper ads. You can check out the links and some preview images below.